From places of worship to educational institutions to former residences of prominent figures, 72 buildings here have been gazetted as national monuments. This is the third of a weekly series revisiting these heritage gems. Each of their stories is a yarn that is woven into the rich tapestry of Singapore's history. The year is 1956. On a fine morning in March, the first students at Nanyang University, or Nantah, are on their way to attend their lessons at the university. Books in hand, they chatter among themselves as they pass under the Nantah arch. Ivory white and imposing, the arch glitters in the morning sun - the name of the university and the year of its founding emblazoned on its central beam. The arch has three gates - which symbolise three elements of Chinese traditional philosophy - tian (sky), di (earth) and ren (humanity or civilisation). The gates also symbolise three different "talents" - da cai (the wisdom to govern a country); chang cai (the capabilities of a trade); and qing cai (the ethics of man). These principles encapsulate the best of Chinese traditional education, and the hopes of the aspiring youth: to one day find themselves worthy of being called a true talent. The interior (above) and the exterior of the Chinese Heritage Centre. Besides preserving and promoting Chinese heritage, the centre is a platform for intellectual exchange and a place where historical artefacts and data are curated for research and education. When the students cross under the arch, it serves as a reminder of who they are, where they come from, and how privileged they are to receive a university education. Founded in 1955, Nantah was built on a campus donated by the Hokkien Huay Kuan. It closed in 1980 and Nanyang Technological University (NTU) later occupied its grounds. Some 60 years on, the arch stands alone across the Pan-Island Expressway, a solitary reminder of Nantah's once vast and sprawling campus. Retired veteran journalist Toh Lam Huat, 63, who graduated from Nantah in 1977, spoke of the arch with much pride and nostalgia. Mr Toh said in Mandarin: "I think the arch has been rightfully preserved - because it was the gateway into the university. Every Nantah student passed through that arch. "It's a pity that it's disconnected from the new buildings, but at least it's still there. The arch's historical and cultural meaning, as well as the deep symbolism that it holds, simply cannot be replicated or found in modern buildings." In 1995, a replica of the arch was unveiled in Yunnan Garden, in front of the former Nantah Library and Administration Building. The original arch and the former administration building were collectively gazetted as national monuments in 1998. Prior to it being named a national monument, great care was taken to preserve the former library. Even the hinges on the door, the mosaic tiles, and the striking vermilion of the banisters remain true to the building's original form. 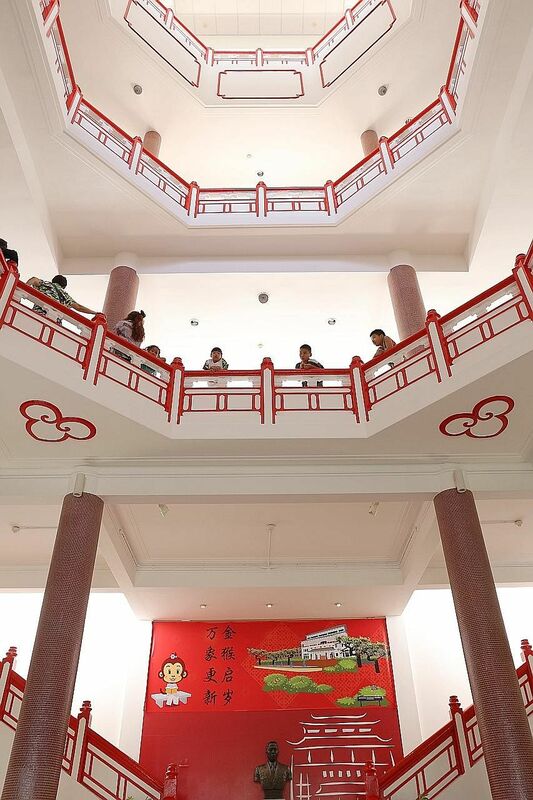 Construction of the building began in 1954, when Chinese community leaders set out on a mission to provide tertiary education to the Chinese-educated in Singapore. Chinese from all walks of life - from cabaret girls to rickshaw pullers - donated their hard-earned money. The building was designed by Singapore's pioneer architect, Mr Ng Keng Siang, and construction was completed in 1955. The elegant building now overlooks the adjacent Yunnan Garden like an armchair atop a hill, as a reminder of the Chinese community's sacrifice. The building's ... Chinese- style roof and exposed red brick facade marry both Eastern and Western architectural elements... Of even greater signifi- cance are the details of the Chinese roof. The wa dang (circular eave tiles) and di shui (triangular drip tiles) are imprinted with the Chinese characters "nan" and "da", the abbreviation of the university's name. Professor Zhou Min, director of the Chinese Heritage Centre, said the building's location was chosen to bring good fortune, peace and prosperity while safeguarding the primacy and permanence of Chinese culture. The building's distinctive Chinese-style roof and its exposed red brick facade marry both Eastern and Western architectural elements, in a way reminiscent of early Nanyang architecture. Of even greater significance are the details of the Chinese roof. The wa dang (circular eave tiles) and di shui (triangular drip tiles) are imprinted with the Chinese characters "nan" and "da", the abbreviation of the university's name. The building's initial use as a library is highlighted by a stunning sky well, shaped in the form of a ba gua or octagon, eight trigrams used in Taoist cosmology to represent the fundamental principles of life. While the ba gua is commonly associated with fengshui, in this instance it bears reference to the sacred, unchanging universe, marking a physical space in which philosophical pursuits may take place. In 1966, the building was converted into the Administration Block. In 1995, the building became home to the Chinese Heritage Centre (CHC) at NTU. Besides preserving and promoting Chinese heritage, the centre is a platform for intellectual exchange and a place where historical artefacts and data are curated for research and education, Dr Zhou said. At the centre is the Wang Gungwu Library, which is named after the prominent historian and houses over 50,000 volumes and 2,000 rare Chinese textbooks. The centre also showcases two exhibitions, including the Nantah Pictorial Exhibition which features a collection of over 130 archival photographs from the university's founding to the present day. Dr Lim Boon Hock, the centre's senior assistant director, said: "This exhibition captures the spirit behind the founding of Nantah, and helps visitors and ex-students alike to remember our history - from the days when the Chinese community pitched in to build the university, to where it is now. "The exhibition and the CHC - they keep the Nantah spirit alive, a spirit that many still hold dear."